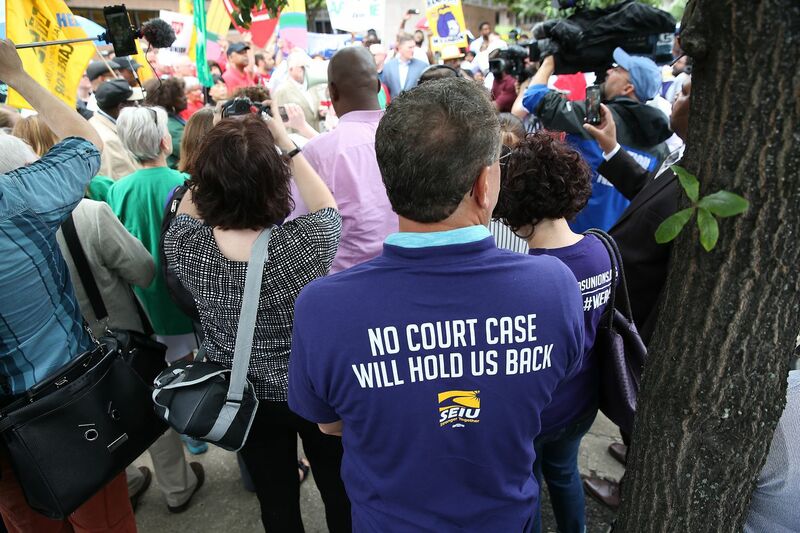 Philadelphia unions rally outside Federal Court in Philadelphia, PA on June 27, 2018. As the U.S. Supreme Court prepared to issue a landmark ruling on public-sector unions, a longtime high school English teacher from central Pennsylvania named Keith Williams made a big career change. Four weeks ago, Williams, 43, became the face of a statewide campaign to let government workers know that they can drop out of their unions. As the Pennsylvania director of outreach for nonprofit Americans for Fair Treatment, Williams says it's his job to help workers navigate the "convoluted process" to get out of a union and to fight a misconception: that unions are the voice of public-sector workers. He was short on specific details — it was still early in his tenure, he said, and he was just getting the website up to speed — but he did say that he'd take a "grassroots" approach to relationship-building. He planned on using social media and mailers to get the word out, but his primary tactic was prioritizing "one-on-one communication." "Everybody knows somebody," he said, noting that Americans for Fair Treatment already has a group of public-sector workers advocating for their cause. In a long-awaited decision, the Supreme Court ruled Wednesday in Janus v. AFSCME that it's a violation of free speech for public-sector unions to charge "fair-share fees" to workers who choose not to be part of the union — even though those workers are covered by the union's contracts. The ruling has been described as a crushing blow to organized labor that will result in the slashing of union budgets and consequently political donations. But Philly labor leaders say that they think it could make their unions stronger as they get their members to sign "recommitment cards" pledging loyalty to the union. On the other end of the spectrum are such groups as Americans for Fair Treatment, a fairly recent nonprofit whose three-member board includes the CEO of the pro-business Commonwealth Foundation, which is backed by conservative funders tied to the billionaire Koch brothers and has been open about its intentions to "slay Pennsylvania's Big Labor Goliath." It's a battle for worker attention, with both sides using organizing tactics — those commonly associated with unions — to get people on board. Philly labor leaders don't know of any members being visited at their homes by anti-union canvassers encouraging them to "give themselves a raise" by opting out of paying fair-share fees, but they expect those tactics will begin any day now. They also anticipate that unions will get "FOIA-ed," meaning that groups such as Americans for Fair Treatment will file Freedom of Information Act requests for union members' names, which are public because they work for the government, and match it to voter files to get their addresses (SEIU 32BJ spokesperson Julie Blust said some of the union's members in Western Pennsylvania were already FOIA-ed). "We know the whole approach because of what they've done in other states," Kirsch said. "But for the most part, it's not going to work on our members. Our members are too smart." He said that one-third of its members have signed recommitment cards so far, including those who pay fair-share fees. Williams of Americans for Fair Treatment said he did not plan on using those tactics. "I don't foresee knocking on people's doors as a great way to build a relationship," he said with a chuckle. It was a change in his school district's union in 2013 that started Williams on his new path to advocacy. Pennsylvania State Education Association members working at Conewago Valley School District voted to become a "closed-shop" union, which meant the union could collect fair-share fees from non-union members such as Williams. Feeling forced to become a dues-paying member of a union he did not want to join, he was furious. He contacted some friends in Harrisburg who were knowledgeable about labor laws to see whether there was anything he could do, and they scripted out the different methods of opting out of a union. As part of his new job, Williams also runs Free to Teach, a website that features such resources as "Four Steps to Leaving Your Union" and a letter template for teachers who wish to quit their union. Free to Teach was launched by a Commonwealth Foundation policy analyst named Priya Abraham Brannick, who described her duties for the project on LinkedIn as "finding, recruiting and cultivating relationships with teachers, with about 20 educators speaking out publicly within the project's first two years, […] managing ongoing email campaign to 100,000 Pennsylvania public educators; and identifying public litigation opportunities to aid teachers in protecting their First Amendment and labor rights." Williams, who works out of Harrisburg, said he's currently the only full-time staffer for Americans for Fair Treatment, though the nonprofit is also doing work in New York. He reports to the organization's board — Tim Hoefer, Commonwealth CEO Charles Mitchell, and Mike Reitz — all of whom he described as people from the public policy world. That's one reason they brought him on, Williams said, to get someone with experience as a public-sector worker. He described Americans for Fair Treatment's funders as those from "private businesses from all over the state who are interested in our message of worker freedom and supporting educators."